Samsung has done an unusually good job of keeping its flagship Galaxy S5 smartphone tightly under wraps and we haven’t seen any quality pictures of the device leaked… until now. 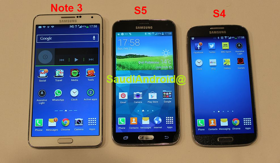 @SaudiAndroid has posted several pictures of the Galaxy S5 that show the new smartphone’s larger frame compared to the Galaxy S4 and a new rear casing that looks much more like the pleather shell that Samsung introduced with the Galaxy Note 3. Instead of the smooth, cheap-feeling plastic that was a staple of the Galaxy S III and Galaxy S4, the Galaxy S5 seems to have a more high-quality plastic that’s marked with little pores that will seemingly make it much less likely to slip from your hands. If there is one major disappointment with these leaked pictures, however, it’s that they don’t show any kind of metal casing that many Samsung fans had hoped the company would include as part of a high-end version of the Galaxy S5. @SaudiAndroid says that there’s “no metal” in the casing of the Galaxy S5 although that doesn’t mean that Samsung won’t be releasing a separate metal version of the device. Samsung is unveiling the Galaxy S5 later on Monday at Mobile World Congress in Barcelona. 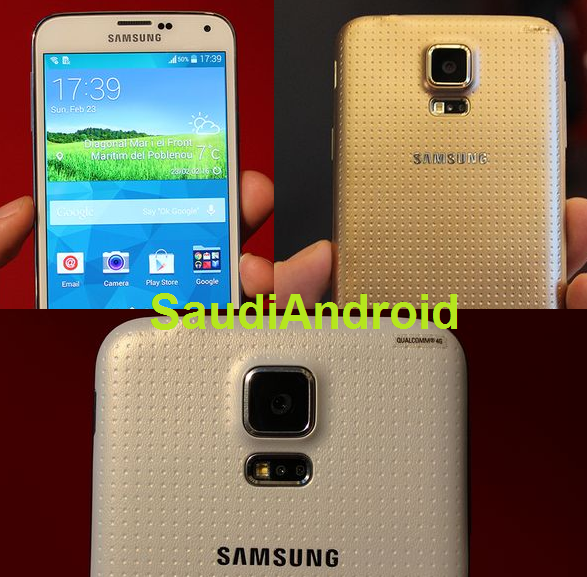 Rumored specs for the Galaxy S5 include a 5.2-inch display, a 2.5GHz quad-core processor or an 8-core Exynos processor depending on the model, a 20-megapixel rear-facing camera, a 2-megapixel front-facing camera, 3GB of RAM, a 3,000 mAh battery and Android 4.4 KitKat. 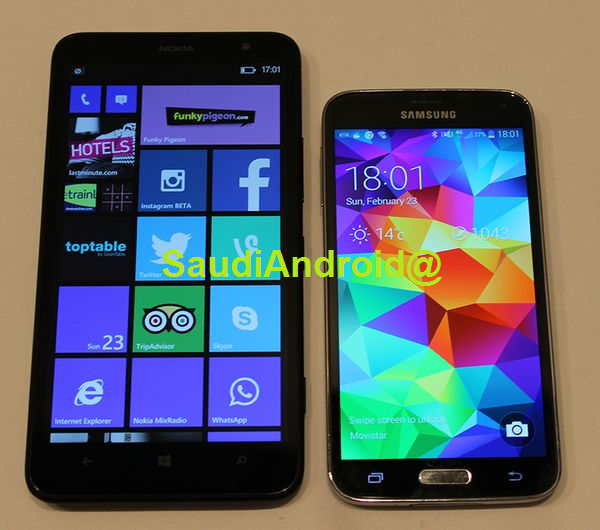 More of @SaudiAndroid’s pictures of the Galaxy S5 follow below.